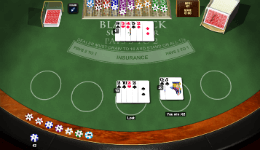 Blackjack Surrender is a special variation of the common American blackjack with one twist. Surprisingly, the twist is the option to surrender your hand and get half of your bet back. Many of you are probably familiar with this rule from Atlantic City blackjack and to be honest, we are not sure why this game isn’t just called Atlantic City, since it follows pretty much similar guidelines. Maybe the developers thought that the original name doesn’t appeal to European or Australian players or just for branding. It doesn’t really matter. That’s what they decided and we are here to present you Blackjack Surrender. We will start by listing the main rules and then focus on what is the best strategy to play this game. Played with 4-6 decks of 52 cards. You may choose to surrender your hand and get half of your bet back (unless the dealer has blackjack). Dealer must draw on 16 and stand on all 17s. You can split only once. You can split all 10 value cards (for example 10 and K). 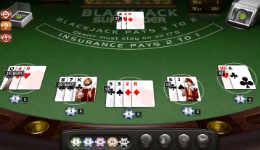 Split Aces receive only 1 card. You may double on any two cards and double after splitting. The main problem that we’ve noticed in regards to surrender option is that 49% of the players overuse it and the other 49% call it a sucker bet. It’s not! Using the surrender option correctly can increase your odds by 0.1%. It’s not a lot, but shouldn’t been overlooked either. Surrender hard 16 vs. dealers 9, 10 or A. (Do not surrender 8,8 – split them). Surrender hard 15 vs. dealer’s 10. That’s it. Besides that, follow standard American / Vegas Strip blackjack strategy. Surrender hard 16 vs. dealers 9, 10 or A, including 8,8. Surrender hard 15 vs. dealer’s 10 or A. Surrender hard 17 vs dealer’s A. Games OS is played with 4 decks, while Playtech version with 6. 7 Card Charlie: in Playtech game, a hand of 7 cards automatically wins. Winning odds: Theoretical return at Playtech is slightly lower, 99.62% vs. Games OS 99.66%. This is the lowest house edge of any Blackjack Surrender games, including all Atlantic city blackjacks.